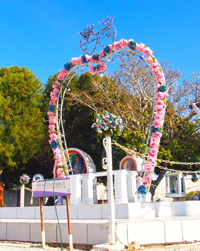 Koyari, named after its location and its neighborhood, has been the center for prayers, rosaries, peace and repentance for many who have visited since the early days of its existence on 2000. It’s a place that calls the attention of many. 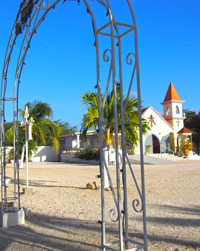 After the news of the apparitions of the Virgin of Grace and Jesus our Friend and Savior was making its way through the Aruban community in 1999, more and more people came to Modanza during the apparition sessions, despite of the late night hours in that particular time (the first Rosary started at 10:00pm and the Blessed Virgin appeared to Valerie just before 12 midnight – this the Blessed Virgin considered a penitence / sacrifice, as many of the present were people with jobs to attend to the next morning). The growing quantity of people and the lack of seating and parking space soon became an issue. Jesus Christ in one of His apparitions to Valerie told her, as He wanted more of His Children to come to Him and His Mother that she should look for a terrain for Him where more people could be accommodated – He Himself would let her know when she has found it. So Valerie obeyed the Lord and drove around the island together with Junny and Eta Tromp for weeks. Many people called her offering her terrains around the island, but as she visited the terrains, she felt nothing. It was a day when Valerie needed to visit Junny and Eta Tromp’s home, loyal assistants to her in her mission and witnesses of many miracles while being by her side since 1998. It was the first time she came to their house. They spoke and Valerie was about to leave, when she stepped outside and she asked them to show her around their back yard, then full of wildly growing trees and cacti. As she walked towards the back wanting to see their yard and got to the middle of the terrain a very loud voice came to her saying “Here I want the terrain” and again “Here I want the terrain”, “Raise your face to the sky” the voice said and Valerie saw clouds crossing each other and then separated creating an opening. – one thick ray of light came down on the terrain where she stood. The voice repeated “Here I want the terrain”. The soil on which she stood started shaking and she remembered the night her room shook during the first miracle. The voice said again “Start building it now for Me”, again the soil shook and the wind blew strong around her. Her heart was beating very fast and she turned towards Junny, Eta and Mark – her husband – and told them “Listen now, open your hearts, your ears, look at me in my eyes… Do you know what just happened? Jesus asked me this terrain. Junny and Eta were in awe and ecstatic at the same time. 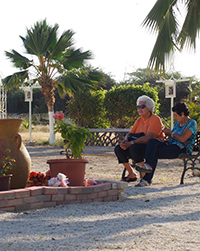 Junny and Eta were ecstatic and amazed as they could never have dreamed – after so many years of working voluntarily for the Blessed Virgin and Jesus – that Jesus would choose this land for Him. The days, weeks and months following this day would be of hard work and fund raising in order to start the beginning of a new place for the Lord and the Blessed Virgin. On this terrain was a well of water, which belonged to Junny and Eta. A majority of the neighboring terrains were once used for plantation in the past and so was this terrain. Therefore many of these terrains had wells on them. This well had a depth of 24 feet and had fallow water in it, which had a salty taste. Though the Lord told Valerie that He would bless the well and the water in it and that the water would be miraculous and sweet so that people could drink it, use it for bathing, on their skin, use it to make the sign of the Cross or for prayer. “The water will never end, because on the world everybody needs water”, Jesus told her. When the Lord chose this land, he always knew it would be His. He would slowly put His Divine touches to what was going to be His and for His children. The Lord came one day to Valerie and told her that He blessed the water of the well. He told her that the water was given His purest blessing and that it should be used for amongst others, helping the sick. Junny upon hearing the news pumped some water and tasted it and to his surprise it wasn’t salty anymore, it tasted like drinking water. Many others drank this water during this time and felt the same way. This water was even tested by a person working at the local Water Company, who concluded that the water is good and good for drinking. 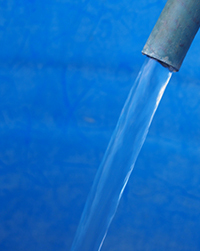 Many people have been drinking this water and have given it credit for pain relief and healing. It has even contributed to more significate matters such as cancer, leper, HIV, dialysis, tumors, faith and so on. People come with their bottles and fill them with the blessed water to take home or to take it with them to the countries they come from to help their families and other loved ones. Nowadays there are bottles at Koyari for everyone. The water has also been called the Miraculous Water. Its name is Holy Water. The water in this well comes from underground and is not fed water by any other sources than its natural source. The height of the water depends on the sea level, as Koyari is situated near the coast of the island in the neighborhood of the hotels. So the Father gave to His children more of Him in the water He blessed. And His children would come. But the water wasn’t enough, as He wanted His children to be reminded of His suffering for them. He needed to have His symbol there, the symbol recognized all over the globe as His, the Cross. The Lord in one of His early apparitions to Valerie, asked her to provide Him with a Cross for Koyari. The Cross needed to be large and visible. Valerie worried, knew only one person who could do this job. When Valerie asked Mr. Benny, he immediately agreed and felt honored. Mr. Benny and his father made the Cross out of wood and as simple as possible – as Valerie requested him. The Cross was finalized and brought to beginning of the San Miguel road. It was carried by several men and walked in a procession to Koyari on March 29th 2000. All believers prayed and sang during the procession. After arriving on Koyari, all paused to sing the national anthem in front of the Aruban flag and then they walked slowly to place the Cross in its base. After the Cross was placed, Valerie asked a local spiritual Man, Mr. Alex, to make a base for the Cross out of natural stones. Mr. Alex made the base, stacking stone by stone in a very dedicated manner around the Cross. 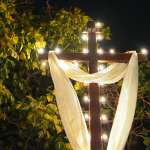 The Cross, as Jesus says, is the sign of survival of Faith throughout the centuries. It is the sign that reminds us on Him and His suffering for us. It is the strength of His presence and a reminder that He is amongst us. The Lord explains to us, that the Cross is an important part of our lives: the horizontal part of the Cross represents our behavior towards our family and the vertical part of the Cross represents our behavior towards the Church. Jesus explains that these two parts go together and should be seriously considered every day of our lives – only then we will be saved. The Cross was blessed the same day it was placed, together with the Holy Water, by Fr. Rafi, a local priest of Paradera. So the Mother obeyed His Son and came to her child in Aruba as The Father had plans for her since before she left the womb of her mother. He came to her and brought her His mother. Never has she dreamed of receiving such a gift, as she calls it “a greater gift than bringing a child into this world”. 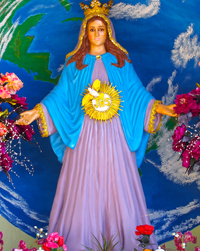 In one of the apparitions at Modanza, the Blessed Mother asked Valerie to make Her a statue. This statue should look as She appears to Valerie. The Blessed Mother also indicated that the image of Her should be placed at Koyari in the left back corner. Valerie wouldn’t know how and who to go to for such a task as statues were not made on Aruba, though someone who met a Brazilian man on the beach who was sculpting in the sand, found out that he was a sculptor in Brazil and asked him if he could sculpt the Blessed Virgin. The statue would be donated by Mrs. Mary Wever – as Jesus chose her for this job. Mr. Omar drew the Blessed Mother, according to the Visionary’s specifications, with open arms and with the specific colors. He worked day and night in a house in Colony (San Nicolas) with his bare hands and inappropriate tools and plaster while Valerie evaluated his work slowly. When the statue was done it was blessed by a local priest of Savaneta, Fr. 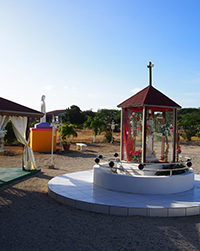 Juancho Pilongo, in a small ceremony and then driven in a car procession from Colony to San Miguel, where again believers gathered to walk in a procession to bring the Blessed Mother’s statue to Koyari in the same manner as the Cross. The Blessed Mother’s statue was lifted with a forklift and with the help of some believers placed on Her pedestal. Where the Son is, is the Mother, as He once said “All who believe in My Mother will get to Me”. And so the Son asked her to make Him an uncolored statue and place it at the right of the cross as He should be – near to His Mother and near to the Cross he carried for us. His statue should be white as a symbol of purity and divinity among humanity. Jesus didn’t have specific requests to Valerie other than His statue should be white and with open arms, as His mother. Why with open arms? It is because Jesus and Mary never neglect our requests. He asks to look for Him and His Mother always, not only when you need Them or you are having problems. Omar, the same Brazilian sculptor, made Jesus’ statue out of the same materials as the Blessed Virgin. As Jesus didn’t give Valerie a specific description of His image, Valerie agreed to make His statue like the one of Brazil. So Omar worked tirelessly until He was ready. 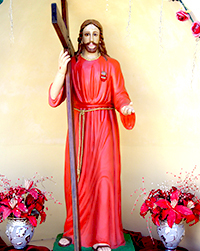 Jesus his image, as that of His Mother, was blessed by the same local priest of Savaneta and driven in a car procession to San Miguel and walked in a procession to Koyari, where He was placed on His pedestal. These were only a few of the processions that ended at Koyari. And He wanted His childhood to be remembered and asked her to get Him his image as the Divine Child, as children are loved by Him and He wants them to come to Him. So the image of the Divine Child (Divino Niño) was brought from Colombia, blessed by the local priest Fr. Mariano of Oranjestad and placed on His pedestal. The presence of the image of the Divine Child on Koyari represents also the start of the miracle of the Visionary. Jesus gave it also this name “Divine Child of All of Us”. Many miracles have happened during the time of the novena to the Divine Child in December. 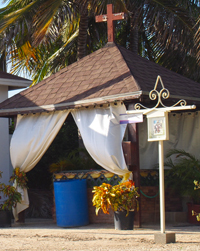 As He and His Mother were beside each other He wanted a House to receive all of His Children of Aruba and the world. And so he asked His child to provide Him with a chapel, bigger than the one at Modanza. The Chapel should be small, but would be big in His heart and as the Chapel miracles will happen on the terrain. Work started and was around the clock – there was no day or night for all the people who helped. The chapel was finished in a period of two months as the rush with the building was created since the chapel needed to be done in order for the Blessed Virgin to start Her apparitions at Koyari. Jesus gave Valerie the name of the chapel: ”Creation of the whole world to come to Me”. During the plastering of the outside walls, the image of the Cross marked in the cement and at that same place – at the front – today a Cross is placed. The colors of the chapel reflect the colors of the Crown. At the side of chapel a tower was built and two bells were bought with fundraising money. Inside the tower a large was Cross placed; this was blessed by Father Rey of Oranjestad. In the Chapel Jesus requested to place the Holy Family and St. Michael the Archangel and outside of the Chapel at each side, Archangels Gabriel and Raphael. Also on the walls he asked to place pictures of the way of the Cross. Behind the chapel a row of 4 lavatories was built and storage space for chairs. An office was built with an adjacent kitchen to provide a place to meet and also store important items. The kitchen space was given a fridge and afterward a cabinet was added, some utensils and coffee maker to provide for the volunteers. To centralize and mark the place of the apparitions, a pedestal was built with in the middle a glass table; it was built at the place indicated by the Visionary for the apparition of the Virgin Mary. At the glass table an iron arch was placed, but later the arch was removed and replaced by a large heart-like arch. There, at that glass table, the Visionary kneels down every 25th to receive the apparition of the Virgin Mary. All that is white, is purity, is beauty, is divine – The terrain was covered with small white stones to mark the presence of the divine. Everything was placed at the right place, the Cross, the image of the Virgin Mary, the image of Jesus, the image of the Divine Child, the Chapel … the office, the kitchen, storage spaces, audio spaces… All were built by volunteers who came to put their heart and efforts in providing every stone, block, cement, sand, paint, door, window, chair, cable, tools etc that was used to build every single building on our premises. This is was Jesus told the Visionary that would happen. Everything was right – This marked the beginning of the journey of faith and devotion of the Apparitions at Koyari. Through the years, Jesus requested more and more was given: He requested the image of St. Francis of Assisi as this miracle began on St. Francis’ Feast Day, October 4th 1998. The image was purchased by the faithful. 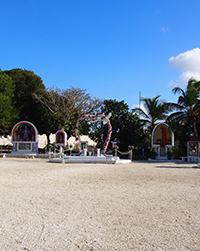 The next devotions were introduced and their images were also placed on the terrain: St. Anthony of Padua, St. Therese of Lisieux, St. Claire of Assisi, Venerable Jose Gregorio Hernandez. The image of the Assumption was introduced to give strength to do those who do the Rosary of Sacrifice around Her image. Also, a Way of the Cross was put outside for the use during Lent, where the faithful come together at 3pm for the hour of Divine Mercy and the Way of the Cross. Outside the Wall of Mercy was created, as a central place for lighting candles to ask for Mercy. A small place was created to bathe people with Holy Water. In the back of the images of Jesus, Mary and the Cross plants were placed and nurtured and now there’s a garden. Many people who have come to Koyari / Modanza have had a change of life: They go to church every Sunday and some also during the week, they take communion, they go to Holy Sacrament regularly and confess regularly. Members of the Prayer Group people in need, visit prisoners, talk and pray with them. They visit the sick in the Hospital and pray with them. They help those addicted to alcohol and drugs. They help children with school articles. Regularly they bring clothes and other articles to give out to the needy, also to the church in Sta. Anna to distribute accordingly. 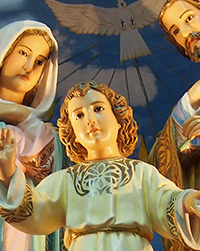 They freely give out religious articles such as Rosaries, Scapulars, Candles and Prayers at different churches such as: Inmaculada Concepcion in Sta. Cruz, Sta. 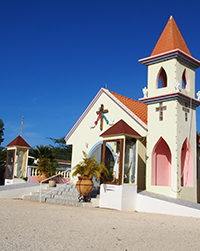 Filomena in Paradera and the Pro Cathedral in Oranjestad. At all religious activities they hand out Rosaries, Prayers, Prayer Booklets, Scapulars, Candles and other religious items. They participate in religious activities and celebrations in the church. Next it was not only faith, love and devotion that had to be nurtured for Jesus and Mary, but also rough times were ahead, as Jesus warned, that made The Voice of Jesus even stronger in faith as a Roman Catholic Foundation and Prayer Group.